This was a fun pic! And I got to draw a Virmir I had not drawn for five years. ;) Hopefully this will clear up some confusion about some of my characters that look a tad similar. There was actually a prototype version of Crimson Flag I attempted to draw back in 2007 that never really took off... because I couldn't really draw back then. ;) A sort of proto-Julian was to be the villain. Later on in 2008 when I recruited Tod Wills to help with the latest, and current version of Crimson Flag, I pulled Julian from the proto-comic and the rest is history. Though my MK story arc is complete, I love MK Virmir to death and will continue to torture him FOREVER. More recently I threw him into the Epic Battle universe because I thought it would be funny. However as a sort of recompensation, I let him destroy Santa. 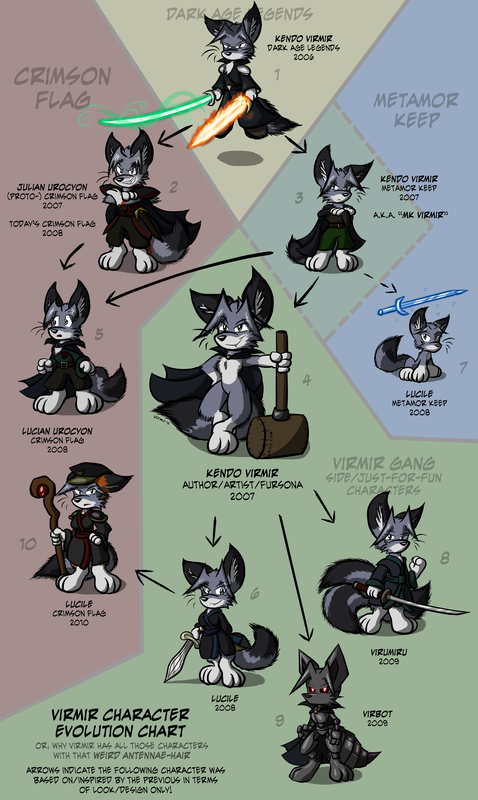 He's shown here as being in both the Metamor Keep section and the "Virmir Gang" section, since I sort of inducted him in as an honorary member to do fun side comics with and such. When I started interacting with the Metamor Keep community back in 2007, as usual I took the name of the primary character of my stories as my pen name. I had done this with past projects before, but never really felt a personal connection to the character. However, people very quickly (albeit jokingly) associated me with "the grumpy one", which is very much not me, so I pushed that author and character were not the same more and more, building my online image in my head long before I was able to draw. Pretending to be a cartoon animal in a chatroom was incredibly relaxing and fun, and thus the toony Virmir was able to express himself for the first time. I do regret this a bit. Lucian is very different from MK Virmir, and I should have been a bit more original with his design. But on the other hand... MK Virmir was just a character from an unrelated story! It's not like I'm suddenly going to get good at art and start drawing him myself constantly years from now or anything! One day I noticed that a *lot* of people have an opposite gender version of their online selves. "Ha ha!" I thought, "Those people are weird. I'm gonna try and draw a girl Virmir just for kicks!" If the main Virmir were taken out of this batch and I had to choose a new primary out of the remaining 9, I would choose Lucile. On the flip side, the Virmir/Lucile combo does provide some sort of consistency throughout my works that I'll probably revisit. "Three tails is a good number, I think. Much more than that and it becomes difficult to do basic things like sit down. ;)"
That is... really all there is to Virumiru. He's just a kitsune parody. I'm not a terribly huge fan of kitsune or multiple tails, but he's fun as heck to draw. I'm not sure if I'll ever think of a story for him though. He's just out there doin' oriental stuff! The glowing red eyes are inspired by the ex-animal bots in that one Sonic the Hedgehog cartoon. Good to have an overview.